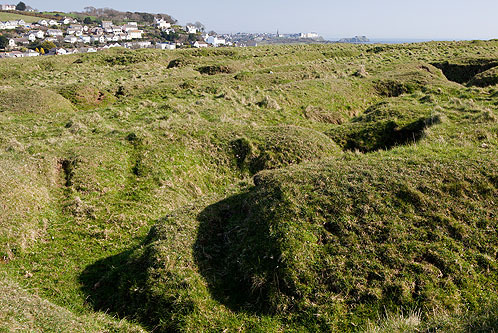 Near the western end of the Penally Rifle Range , near the coast path , are the surviving trenches , cut in the landscape , to train troops before being sent to the Western Front during the 1914-18 War . The CADW website has aerial photos of The Penally Trenches , which show the full extent of this site . Penally Village , Tenby , St Catherine's Island in the distance .